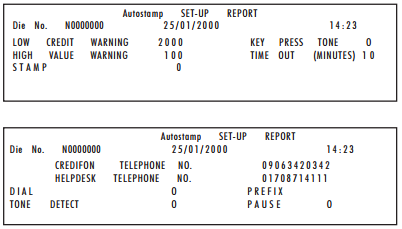 Machine status reports can be printed on self adhesive labels using the franking machine’s own printing mechanism. Provides information relative to current machine status. Provides machine Setup information, comprises two pages. 1. From Ready mode, press the MENU key. Then using the blue keys scroll (< >) to the REPORTS display screen. 3. Next, using the blue keys scroll (< >) to the report type you wish to print. 4. Press “OK” to confirm. The following display will now be observed: INSERT ITEM. 5. To print a report, feed a label pad into the machine in the same way as you would feed an envelope. If the report consists of more than one page e.g. Setup Report, you will be prompted for each page. 6. Once you have printed your report, press the “C” button to return to Ready mode. Your franking machine is equipped with a series of electronic registers to monitor franking transactions. These registers may be displayed as follows. (All register values displayed are typical). 1. To select a Meter Register, from Ready mode, Press the Money bag button. 2a. Credit Register – The Credit Register will display the postage remaining (How much money I have left). 2b. Total Register – The Total Register will display the total postage spent to date (How much money I have spent on postage to date). 2c. Items Counter – The Items Counter will display the total number of items with a valid postage amount printed to date. 3. To return to Ready mode from any Meter Register display, press the “C” button. Low credit Warning – When machine credit falls below or equal to the low credit level, the display will alternate between Ready and LOW CREDIT. Insufficient Credit – When the value selected exceeds the available credit, franking will be inhibited and the ADD CREDIT warning will be displayed. Low Ink – When the ink cartridge requires replacing, the display will alternate between Ready and LOW INK. To allow completion of batch, a further 100 franking operations are available, after which the ink cartridge MUST be changed. Warning No Ink – When the WARNING NO INK display is observed change the Ink Cartridge. Note: When this display is observed, the machine will not operate until a new Ink cartridge is fitted. High Value OK? – The HIGH VALUE OK? display will be observed if you have entered a postage amount greater than the high level limit. To accept the higher postage amount, press “OK” to confirm. Otherwise press “C” to cancel.